First of all I want to say 'thanks' for all the sweet comments about my elephant pattern. When I posted it I was pretty uncertain as to how it would be received. I am delighted that even ONE person liked it - and happily, a few more did too. So, now I am thinking about my next free pattern to post. I'm going to have fun with this, I can tell already. I just finished up a new flowerpot wrap that has a slightly different design than the ones I sell in my shop. It has ties instead of a button and, get this, it's reversible! I always wanted to make the button ones reversible too but having buttons on both sides just made it way too bulky. I am going to TRY to compose a tutorial for this - notice the bold capitalized 'try'. As you may have picked up by now, writing is not my strong suit so I am a little apprehensive about trying to explain directions in words. I'll take lots of photos, how does that sound? Hopefully I will have that 'wrapped up' (cheesy, I know) next week. 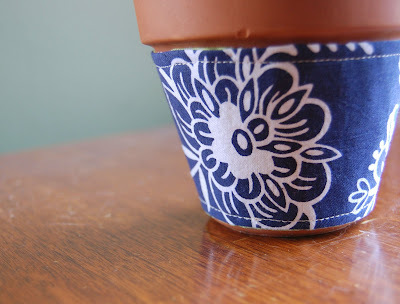 Oh wow, I love the idea of decorating flower pots with fabric!! 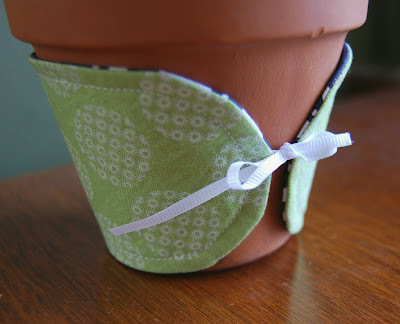 I've been tempted to make and use a mug wrap, but a flower wrap like that is PERFECT!! p.s. I can't believe you didn't think anyone would like the elephant, he is absolutely adorable and you should be very proud!! I don't usually follow patterns, because I like to make my own, but I really want to make your elephant!! This is really a good version of Firefox 3.6.I like it most.